The group mustered up at the usual place in majestic on Saturday, and we left the place around 5:15 PM. Reached devanahalli at around 6:15 PM and everyone was craving for some drink for a refreshment. We had tender coconut and hired a goods-auto to make it to our destination (a no-breeze bumpy ride). We had a brief formal introduction just before we started, and wanted to start ascending as quickly as possible. I requested the organizers to take us through a easy route, and they assured the same. The ascend was quite good, sometimes hauling through bushes, getting bruised, sneaking through a narrow stony path, aping up a elevated rock. I was happy, as we were all on the same boat, run-of-the-mill pace. Ankit was leading, Srikanth was at the end of the trail, allowing us to take breaks, indeed longer breaks upon request, inspiriting saying that we still have the whole night left. That's so humane!! We happened to see so many kinds of insect, so many centipedes (felt creepy sometimes, at sudden sight of them when seen through torch light), a palm-sized scorpion as well. Wish we could encounter a snake as well!! Everyone was mindful of their steps so as not to hurt them. 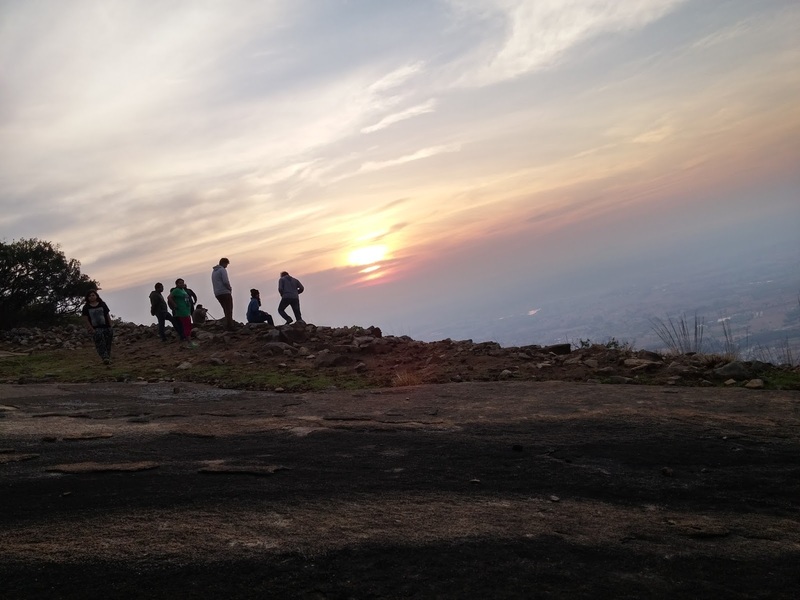 We reached the top, felt happy, enjoying the solace, the cool breeze ( it just meant heavenly for those who experienced Bangalore's summer this year). The city had slept at peace, while we were the bunch of folks who wanted to do something different. The campfire was lit up, unpacked our eatables and did share-some-eat-some, as happiness is only real when shared :) A quick bhelpuri was prepared on the spot, and it's taste was no unworthy and delectable, our hunger pangs subsided. Few from the group prepared roasted corn, under Ankit's surveillance (Chef Sanjeev Kapoor, as I call him). The taste just gets better each time, always yummy-yummier and lip smacking. Half of the group seemed tired by now and muff up to sleep, while the rest continued to play mafia. It was the chill cold and the call for some hot soup woke us up. We huddled up near the campfire to warm up and sipped the soup. It was time for sunrise, the color of the sky started changing as if it was an artists palette, darkness and dawn jelling up. We had few photographers-in-action, time for a group photo!! Packed our bags and started to descend through a different route. Had breakfast sitting together, for one last time. Time to return back to busy buzzing life, after a soulful experience.